WELCOME TO OUR BEAUTIFUL VILLA IN SANTORINI - FIRA On the fantastic island of Santorini, the sun shines in an endless flirt with the sea. 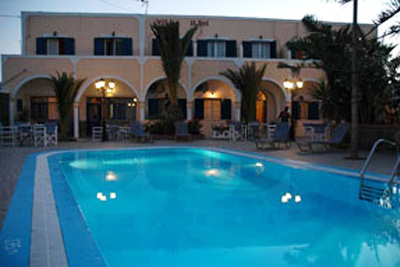 Villa Ilios is located in fira and it is a family owned hotel with a friendly atmosphere and a very clean facilities. Villa Ilios is situated just a few meters from the center of Fira, the capital of Santorini, close to museums, shops, restaurant and bars, as well as the central taxi and bus stations to the beaches and sight seeing areas of the island. Swimming pool Relax next to our magestic swimming pool with a cold refreshing dring and your worries fly away along with the greek sun (Ilios). Room Villa Ilios consist of 15 modern rooms and two studios, each with a television, fridge, air conditioning private bathroom and personal balconies, ensuring a pleasant stay.